Growing up, we were taught that graffiti is bad. Tagging was destruction of property, writing was low-class, anything spray painted was done by vandals. 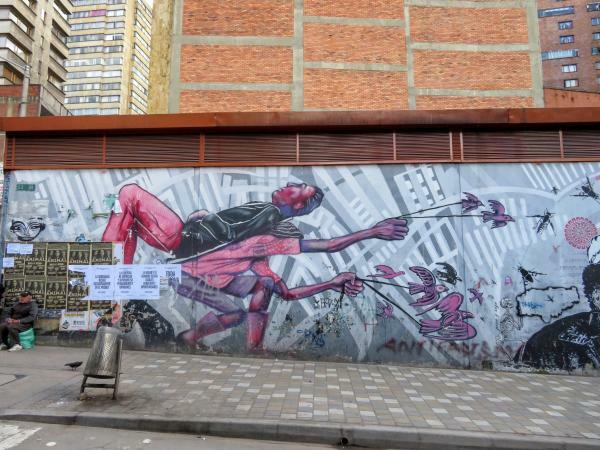 The Bogota Graffiti Tour turned that worldview upside down. Our tour guide, Jeff, is an anthropology professor at the National University of Colombia and he gave an amazing, free, 3-hour tour of the local street art. 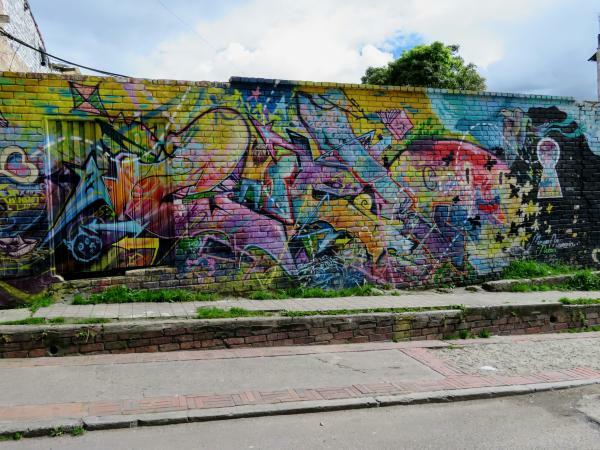 He was personally connected to many artists in the Bogota graffiti community and was able to tell us the background and stories behind many of the works we saw. 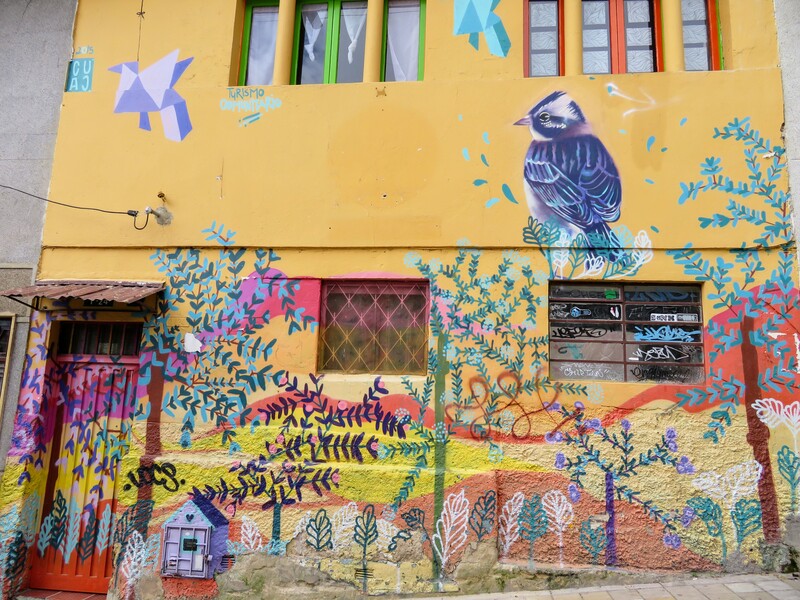 His definition of Graffiti is: a public work of private expression, legal or illegal, which may be political, personal, or fun in nature. We could not recommend this tour highly enough. I’d like to start with one of my favorite artists on the tour: Lili Cuca. 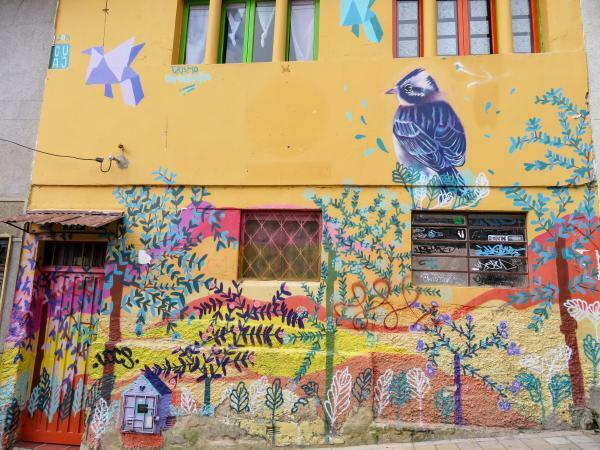 According to Lili, learning to paint graffiti was one of the best things that she ever did. You see, Bogota is not a particularly safe place for women at night. 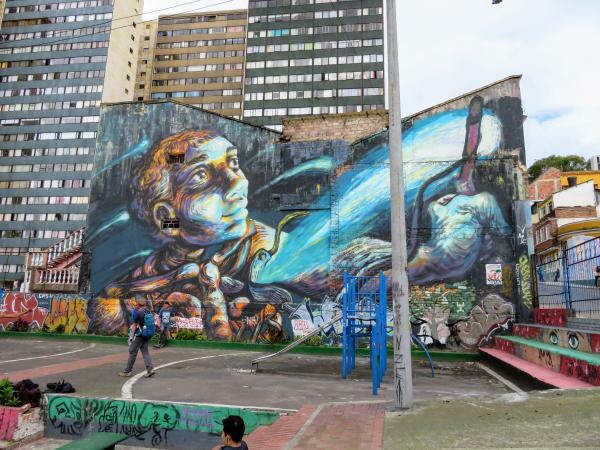 This is also when most graffiti is painted and because of that, there aren’t many female graffiti artists. When Lili was encouraged to learn to paint, she started bringing her brothers as body guards or only painting in large groups. Eventually, she got more and more comfortable with her ability to take care of herself on the street. She described the experience as empowering. I thought her artwork was, too. 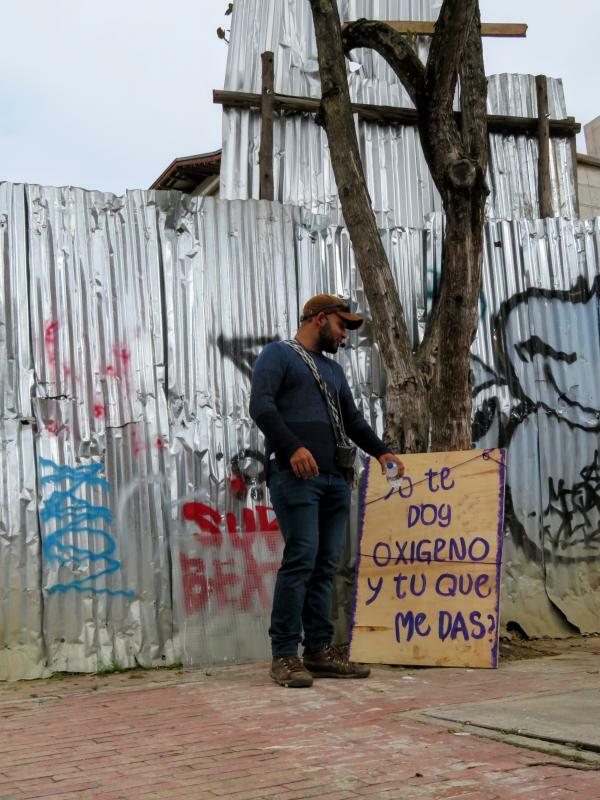 One of my favorites by Lili Cuca. 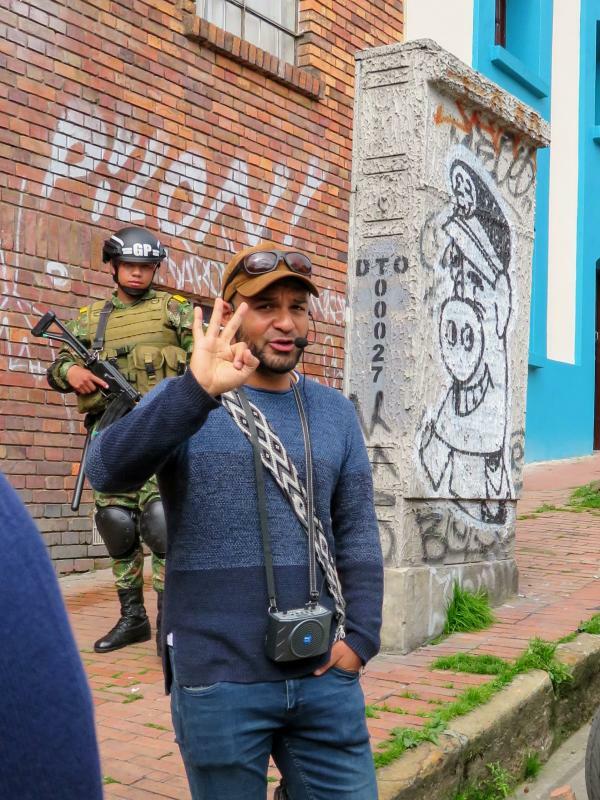 One of the best moments on the tour was when we stopped here to take a look at this pig cop piece and Jeff told us a story about a police-run prostitution ring directly in front of this policeman. It turns out most police officers don’t speak English in Bogota. One really neat aspect of the graffiti culture is collectives, which is a group of artists who join together to paint particularly large works under a single name. This work was done by the APC (Animal Power Culture or Animal Power Collective), and featured over 30 distinct artists. It was done with permission of the owner of the cat-themed coffee shop. We loved how this piece incorporated the light pole, which was about 6 feet in front of the wall. If anyone reading this remembers the name of this technique, please send us a message! 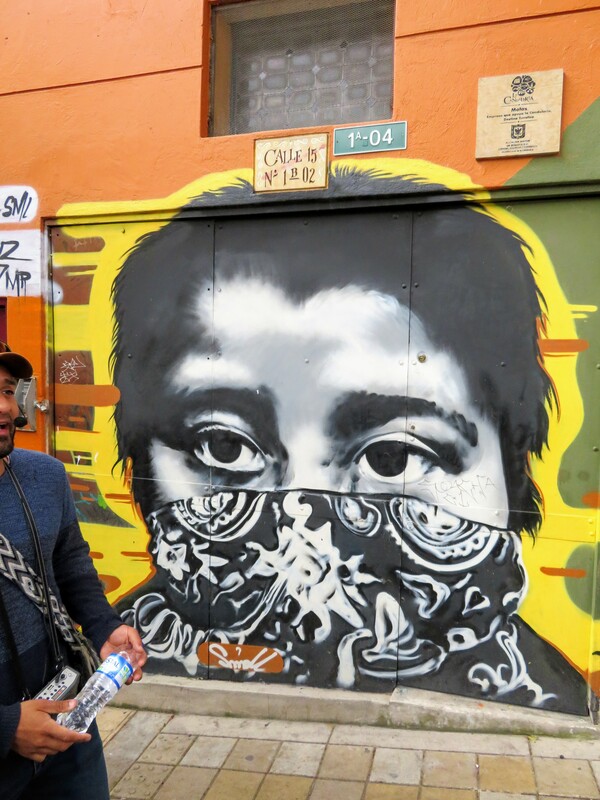 DJ Lu primarily does stencils and paste ups of portraits of real people from the streets of the city, combined with imagery of war and everyday objects. 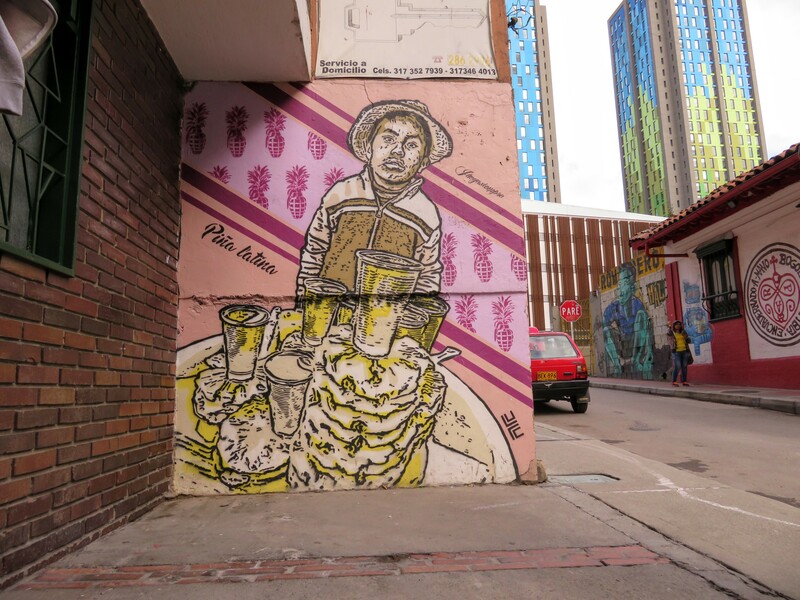 This piece shows a juice seller, in front of pineapple grenades stencils, a reference to the violence surrounding western fruit import. 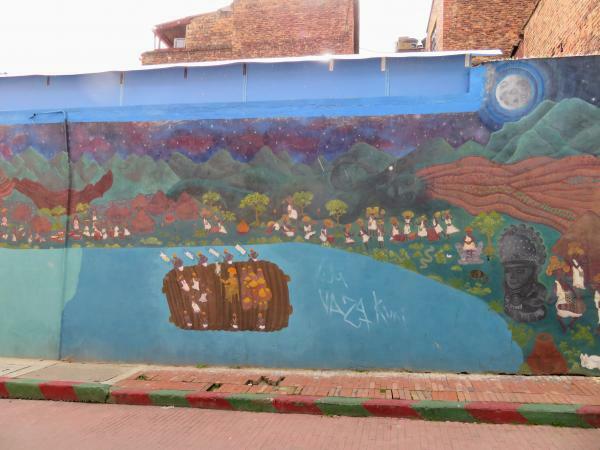 We weren’t particularly impressed by this mural, but do you recognize the raft? This is a portrayal of the Muisca ceremony mentioned in our article on the gold museum, and depicted in a fabulous gold work from that collection. The tag in the middle of this mural is out of character, painted by a “hooligan”. (Technical term). 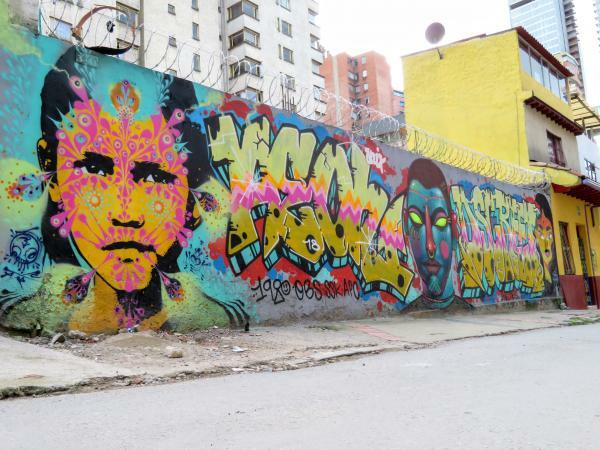 Most taggers are also graffiti artists and respect the work of their peers. Because of that, the most effective way to make sure a tagger doesn’t write on your property is by allowing a mural artist to paint something there. Stinkfish has a very distinctive style of decorating faces with these sunburst-like patterns. Interestingly, we saw him on our Google Chromecast street art feed recently and were instantly able to recognize his work. Bastardilla paints depictions of rural poverty that are primarily sad and dark with glimmers of hope. She painted this one from the ground using extending paint rollers. The Evolution of the Indigenous people. Another work by the APC. Rodez is a fine arts professor at the local University and father to two young artists. After watching his boys grow up with so much artistic talent, he was heartbroken when they started wasting it on painting graffiti. 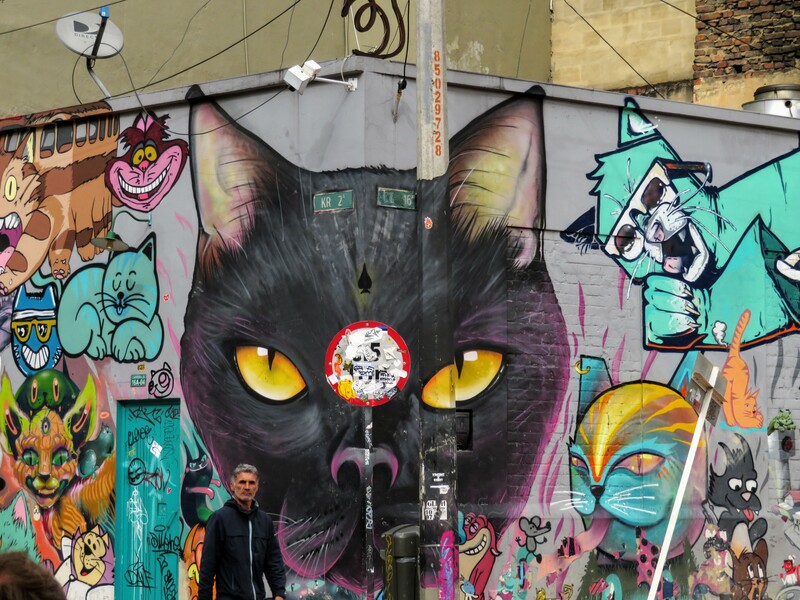 Eventually, one of them invited him to paint and he went along to see what street art is all about. 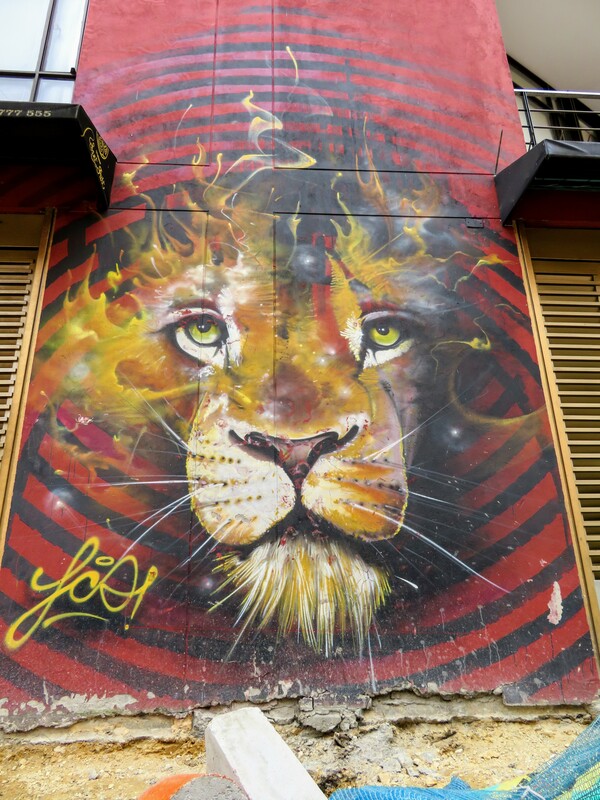 Rodez was immediately hooked and has been painting graffiti ever since. 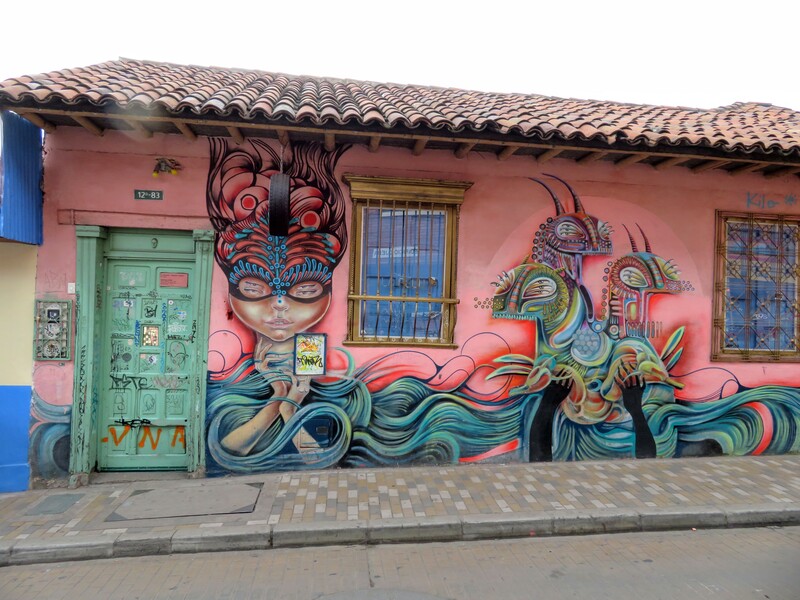 He created this piece to decorate the wall of a salon in the heart of Candelaria with one of his students. This next piece was a little heartbreaking. It features a capitalist, carried on the back of an indigenous man, who is clinging to nature in hopes of escape and freedom. 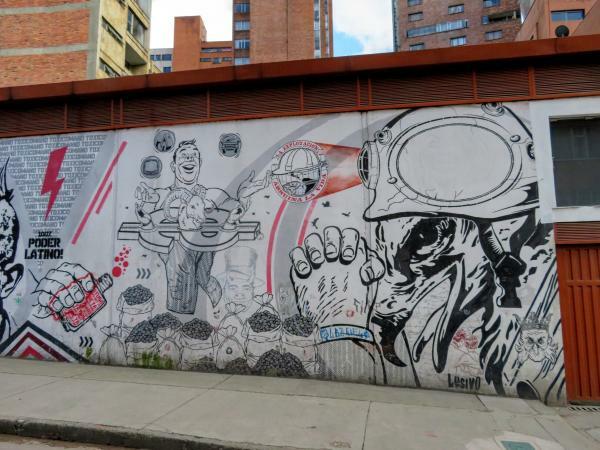 The other side of this mural depicted a mining company, vulture miner, and deluded capitalist. On a more lighthearted note, this beautiful lion was commissioned by a local restaurant. We have so many more photos of graffiti from this tour but these were a few of our favorites. 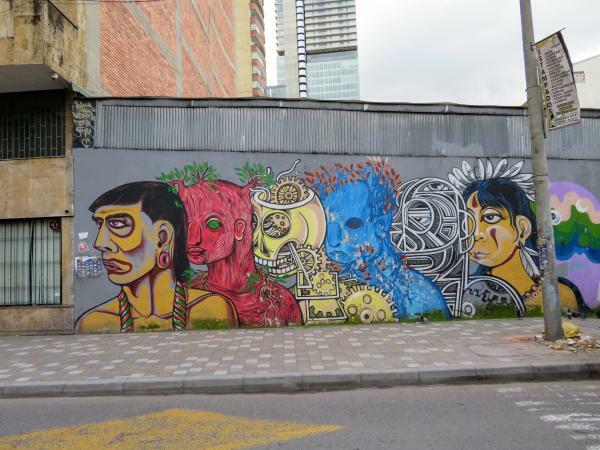 Again, we couldn’t recommend the Bogota Graffiti Tour highly enough.